Keep it coming, guys and gals! 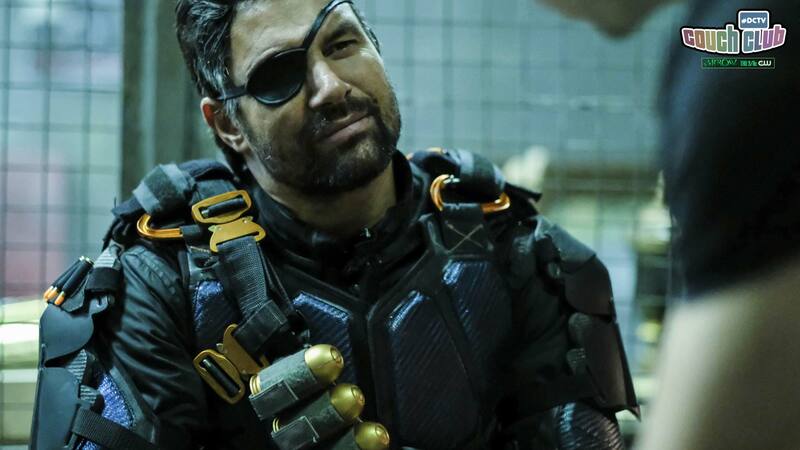 This week, Arrow continued its exploration of fan-favorite character Slade Wilson AKA Deathstroke, while thinning out the herd of other storylines. Tonight delved deeper into Slade and really started to peel back some layers to paint a picture of who he is just before giving him a proper sendoff (for now at least). I was surprised to learn just how truly mad he was. Don’t get me wrong, I knew he was crazy. You’d have to be to live that kind of lifestyle. But I didn’t know the intensity of his psyche. That was revealed nicely to us with the flashback sequences of him training with his son, as well as showing us the brutal injuries and tortures he sustained in the past. Now, bear with me a bit. I’ve mentioned before that I came into Arrow last season, but it’s obvious that the woman in Slade’s mind played a significant role in his life—so much so, that she still has control and can dictate his behavior when she’s not even around. Anyways, I liked how they showed the ease of which the switch could be flipped within him. One minute he’s training and under control with his son, then he sees the Deathstroke suit and something inside of him snaps. He starts seeing that woman in his mind and goes to a dark place and becomes a complete maniac—covered in blood after slaughtering all those men and thinking of doing the same to his own son. I really think the writers did a good job showing us how far Slade has come, but at the same time, how the dormant beast within him is now alive within his son—which Slade finds appalling. That’s a lot of story and character development crammed into two episodes, but it was done very nicely. Lastly, how cool was that shot of Slade walking away and disappearing into that fog/mist? That was a great shot that had a very cinematic feel to it. Tonight also introduced Ricardo Diaz AKA Dragon. In the comics’ world, Dragon was created by greats Dennis O’Neil and Jim Berry and appeared in their novel Kung Fu Master, Richard Dragon: Dragon's Fists, which O’Neil would later adapt to comics. That was the first character to carry the Dragon name and was created at the height of the 1970’s martial arts craze. The second character to don the Dragon moniker is Ricardo Diaz, Jr. This version was created by modern comic-great Jeff Lemire—who killed off the original Dragon and replaced him with Diaz during Lemire’s run on Green Arrow. Diaz is the son of an infamous drug lord who holds a grudge against John Diggle (who was posing as Green Arrow at the time) for the death of his father. I think I saw that lightbulb go off in your head. Although it’s not the exact same scenario, Arrow has certainly done a good job of laying the groundwork for a storyline that would ultimately connect Diggle and Diaz, similar to how they were in Lemire’s run. It all started with Diggle’s shaky hand and the need to seek out something to help him get it under control. Enter Ricardio Diaz—the man behind the serum that Diggle is using. By the way, Diggle…you’re going to play the ignorant card and act like you’re surprised the serum you were buying wasn’t legit? C’mon, man! You’re one of the most thorough and cerebral dudes out there. No red flags were raised when you were buying drugs from some guy in a shady alley? You were cool with putting experimental chemicals into your body, but shocked when you found out that they weren’t being produced by a reputable person or company? How could you buy the “we’re just waiting for the FDA to approve it” line the dealer and Ricardo were telling you while you met with them in an underground lab? While that part was silly to me, the overall narrative of the serum connecting Diggle to Diaz was a nice set up for a storyline that I assume will run for the majority of this season. What I’m most curious about is if the serum will have any sort of effect on John in terms of his health—positive or negative. What if prolonged use of it altered his genetic makeup and he ends up getting powers or something..? I guess we’ll have to stay tuned and see how things play out!